Program Directors are ultimately responsible for the overall administration of the AmeriCorps program. Effective financial management is essential to the success of that program. 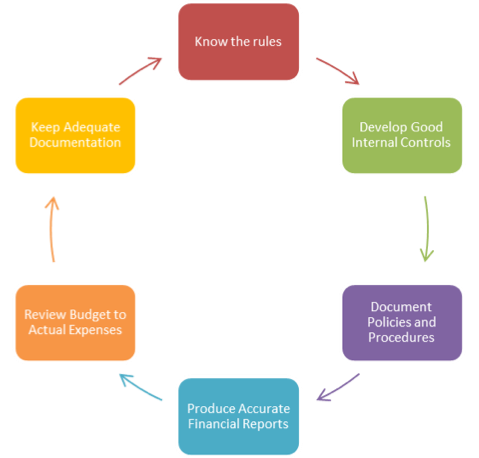 The negative impact of ineffective financial management can range from bad publicity to major audit findings leading to funding being delayed, withheld or having to be repaid. Program Directors need to take an active role in understanding and monitoring the financial systems. Having accurate information, supporting documentation, an efficient accounting system, internal controls, cash management and budgetary controls, and the following policies and procedures in place will help as you work to establish and maintain a high-quality AmeriCorps program. Program Directors and Financial Managers should be familiar with the financial components of their program’s grant agreement. This agreement outlines the approved budget and budget narrative, as well as key financial and programmatic reporting requirements. The parameters set forth there will provide much of the information needed to establish systems and policies at the program level. CCCS should be notified of any potential financial problems. Please contact the CCCS Program Officer if any financial concerns arise during the program year.